The Python Ghana Community (PyGhana) is a body that embraces all friends of the Python programming language in Ghana. We are a community of master programmers, intermediate and even absolute beginners, but one thing we all have in common is the love of Python. Noah is an executive /founding member of the Python Software Community Ghana. 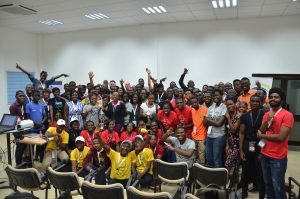 A group picture of the first Python Conference(PyCon) held in Ghana 10 -11 August 2018.